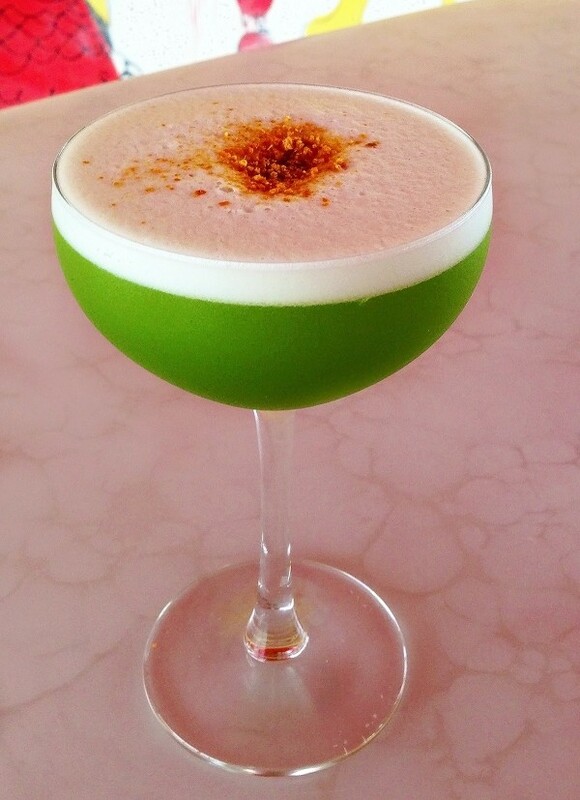 The Matcha Pisco cocktail was submitted to me on behalf of Craig Tabandera, Beverage Director at SUSHISAMBA, a Japanese, Brazilian and Peruvian fusion restaurant in New York City. While the restaurant will be serving this and other Pisco-based cocktails on February 7, World Pisco Sour Day, those of you who won’t be there can make this at home. 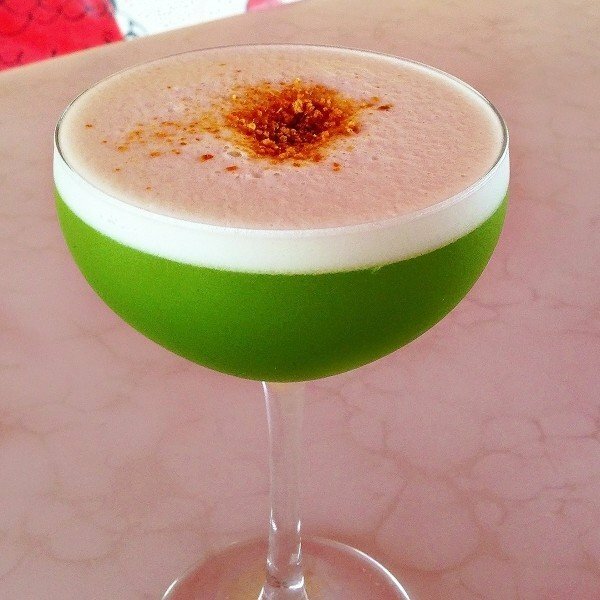 This drink blends the flavor of matcha green tea with Pisco brandy, but there are also notes of orange, lime, pineapple and tarragon, along with that lovely slightly thickened, frothy texture you get with an egg white. (You can use egg substitute if you don’t trust your local eggs to be safe served raw.) It’s a fascinating flavor profile, and it benefits from using a tasty matcha tea, since cheaper grades will taste more grassy and astringent than the better grades. Pisco brandy is made from grapes in the Peru or Chile region. Pisco Porton, the brand this recipe calls for, is colorless and intensely strong at 86 proof – stronger than most brands of vodka, gin or scotch. It has a fruity finish, mostly grape, but also hints of apple. This recipe involves making a couple of your own infusions or syrups, and a couple of techniques you might not have used before, but it’s not as scary as it sounds. The Matcha & Pisco Porton infusion can be mixed together quickly and used immediately – it shouldn’t need to be strained. The pineapple and tarragon syrup involves boiling and reducing, which sounds intimidating if you’re new to it but really isn’t that difficult (see here for instructions). Put the ingredients into an empty cocktail shaker (no ice) and shake well. Then add a few ice cubes in and shake again. Put a strainer over a coupe glass, and strain the mixture through it into the coupe glass (this is called double-straining – using both the cocktail shaker’s strainer and an additional one to ensure nothing but liquid gets through).